The 2014 Chevrolet Malibu has a new 196 horsepower Ecotec 2.5L Intake Valve Lift Control DOHC four-cylinder engine with direct injection and start/stop technology that helps deliver an estimated fuel economy of 23 city / 35 highway. The 2014 Malibu also has an available 259 horsepower 2.0L turbo engine that delivers nearly 14 percent more torque than its predecessor. The all-new Malibu, influenced by the Impala, has a revised front-end appearance, new chassis and suspension. A roomier rear seat creates 1.25 inches more knee room. Malibu has 10 standard air bags and offers New Side Blind Zone Alert and Rear Cross Traffic Alert safety features and rearview camera system. The Malibu’s redesigned center console has a longer armrest with a pair of cup holders and dedicated storage for two cell phones. The all-new 2014 Mercedes-Benz E-Class Wagon, powered by a 3.5 liter 302 horsepower V6 engine, starts at $54,400 and features eleven new or optimized "intelligent drive" systems adapted from the future S-Class set to debut later this year, including technologies that can help prevent accidents with pedestrians or vehicles crossing in front, Active Lane Keeping Assist for avoiding collisions with oncoming traffic and anti-glare continuous high-beam headlamps. The E350 Wagon which gets 19 mpg city and 29 mpg highway arrived in showrooms last month. The 2014 BMW 5 Series offers 13 different variants with standard Xenon Adaptive headlights, including x-drive power and Gran Turismo design. The 2014 BMW 5 Series receives redesigned lower air intakes, standard with an 8-speed automatic transmission and a new inline-6 diesel engine for the Sedan. The BMW 528i Sedan, with a TwinPower turbo four-cylinder gasoline engine, starts at $50,425 (including $925 Destination and Handling). Powered by a 300 horsepower 3.0-liter inline-6 engine, the 2014 BMW 535i Sedan starts at $56,025 and 535i Gran Turismo at $60,925. The 5 Series Gran Turismo receives a modified front apron exuding presence and solidity and comes with standard air suspension, including automatic self-leveling rear suspension. Its redesigned rear end makes it look longer and lower. The 535i sedan can be fitted with a 6-speed manual transmission as a no cost option while the 8-speed automatic transmission is standard equipment with a new coasting function and can also be ordered with Sport Automatic shift paddles on the steering wheel. The BMW 535d, with a 255 horsepower TwinPower Turbo inline-6 BMW Advanced Diesel engine, starts at $57,525. Add $2,300 for the x-drive models and $4,000 for the Gran Turismo editions of the 535i and 550i. The new BMW 550i Sedan with an updated 445 horsepower BMW TwinPower Turbo V8 with Valvetronic throttle-less intake technology starts at $64,825. 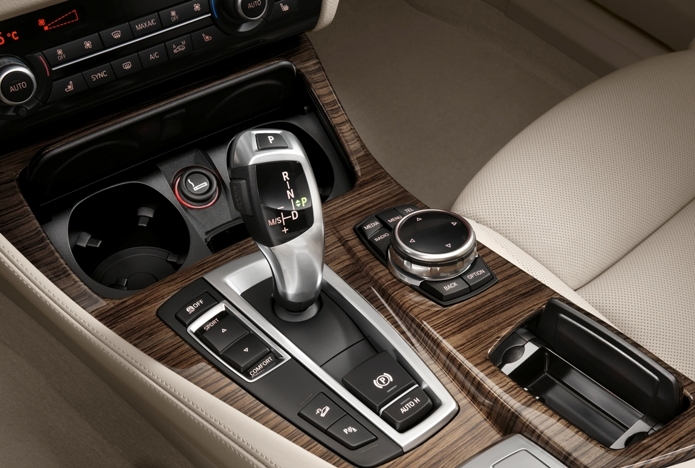 The Sport Automatic option is standard for the 2014 BMW 550i Sedan models and now includes Launch Control. The iDrive controller comes standard with the Navigation system featuring a touchpad surface allowing character recognition. An optional Comfort Access system allows the tailgate or trunk to be opened hands-free, and has been extended to include a closing mechanism, which means that a movement of the foot under the rear apron can now be used to prompt the tailgate to close as well as open. Brake Energy Regeneration, the Auto Start-Stop functionality, and ECO PRO mode, the suite of standard-fitted BMW EfficientDynamics technologies now also includes a coasting mode (which disengages the powertrain while coasting), and the ECO PRO Route function, which can be selected via the Navigation system. Additionally, updated aerodynamics is a key factor headlights are fitted as standard on all 5 Series models, while Adaptive LED Headlights are an option. The side indicator lights are now integrated into the exterior mirrors. Also new in the BMW 5 Series are the Luxury Line and Modern Line, in addition to the M Sport choice, each containing select design and equipment features. All variants of the new BMW 5 Series can also be ordered M Sport Package, which now features a new M steering wheel, LED fog lights, and no-charge Nappa Leather upholstery to further increasing the scope for individualization. The updated 2014 BMW 5 Series Sedan and Gran Turismo will arrive in August. The all-new 2014 Fiat 500L, L as in long, has 42 percent extra interior space with seating for five, powered by a 160-horsepower 1.4-liter MultiAir Turbo engine with two six-speed transmissions. The 2014 Fiat 500L Pop model has a starting U.S. Manufacturer's Suggested Retail Price (MSRP) of $19,900 (including $800 destination). 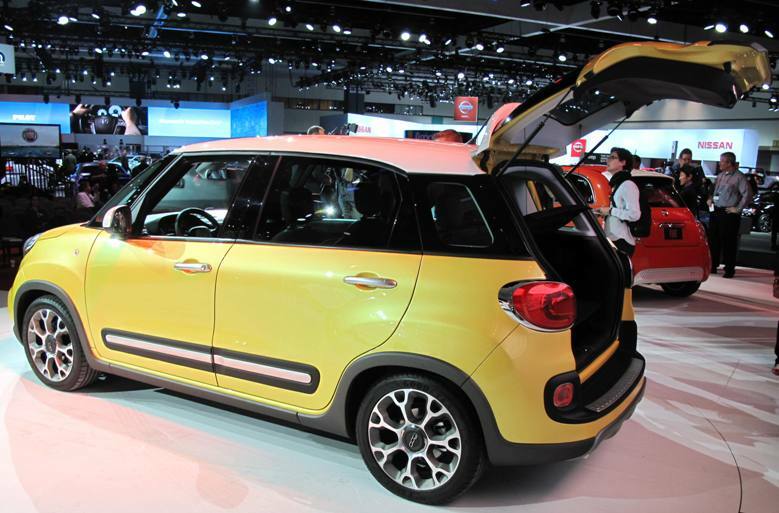 Check out the Fiat 500L debut interview at the Los Angeles Auto Show and the 2014 Fiat 500L website. The 2014 Fiat 500L Easy model adds standard 16-inch aluminum wheels, deep-tint rear glass, body-color exterior mirror caps, front-seat center console with armrest, leather-wrapped square-in-circle designed steering wheel, premium leather-wrapped shift knob with chrome accent, vinyl-wrapped instrument panel available in three colors, unique cloth seat fabric and six-speaker FIAT premium audio system with 520-watt amplifier. The 2014 Fiat 500L Easy model has a starting U.S. MSRP of $20,995 (including $800 destination charge). The all-new 2014 Fiat 500L Trekking model adds to the Fiat 500L Easy model with aggressively designed two-piece front and rear fascias with Grigio Chiaro (graphite) inserts, fog lamps, satin-finished "whiskers," door handles and unique lower front- and rear-fascia accents, Grigio Chiaro wheel arch and body-side sill moldings, Grigio Chiaro recessed license plate area and lower left- and right-side reflector surrounds, and larger 17 x 7-inch aluminum wheels with wider 225/45R17 all-season tires. Inside, the Fiat 500L Trekking features a painted instrument panel bezel and a unique two-tone Nero/Marrone (black/brown) interior environment that carries through on its leather-wrapped steering wheel, door and door-panel armrest bolsters, low-back bucket premium cloth seats and floor mats. 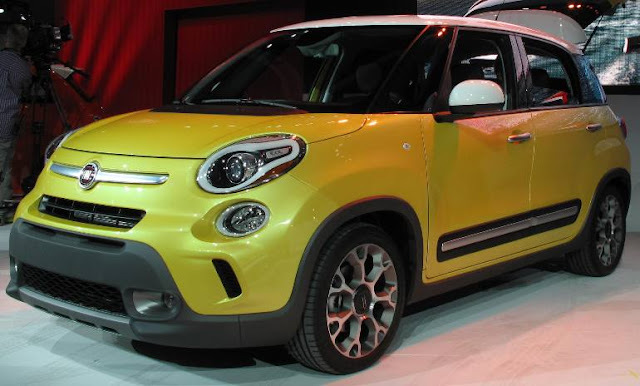 The 2014 Fiat 500L Trekking model has a starting U.S. MSRP of $21,995 (including $800 destination charge). The all-new 2014 Fiat 500L Lounge model adds on to the Fiat 500L Easy model with an innovative Euro Twin Clutch six-speed transmission, 16-inch aluminum wheels, fog lamps, chrome body-side moldings and mirror caps, dual sun visors with illuminated vanity mirrors, premium vinyl-wrapped instrument panel available in two colors, premium heated leather front seats with power four-way adjust, two-way power driver's side lumbar, 60/40 split-fold rear seatbacks with segment-exclusive fore-aft adjustment, recline and tumble feature; integrated armrest with cup holders, automatic dual-zone climate control and auto-dimming rear-view mirror with compass. The 2014 Fiat 500L Lounge model has a starting U.S. MSRP of $24,995 (including $800 destination charge). During the first year of Fiat 500L production, a no-charge Premier Package will be included with Easy, Trekking and Lounge models including ParkSense rear-park assist, ParkView rear back-up camera and Uconnect 6.5 with a larger 6.5-inch touchscreen and navigation. The Uconnect 6.5 features voice operation of navigation, AM/FM and mobile phones; handsfree phone and Bluetooth-streaming audio, text message reader, personalization settings, premium media hub with SD card reader, auxiliary jack and USB inputs. The Fiat 500L Easy and Trekking models have an available Premier Package +Beats/SiriusXM adding SiriusXM and Beats Audio studio-quality sound system with six premium speakers, 6.5-inch dual-voice coil (DVC) subwoofer with trunk-mounted enclosure and eight-channel amplifier with Beats Audio digital sound processing (DSP) algorithm. 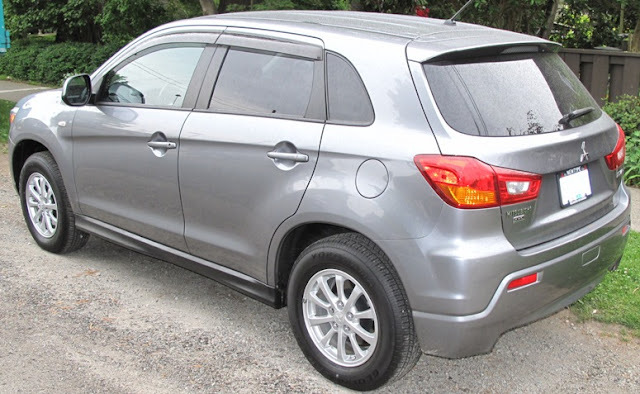 The 2013 Mitsubishi Outlander Sport 5-passenger compact crossover vehicle was named a small SUV 2013 "Top Safety Pick+" award winner by the Insurance Institute for Highway Safety. Outlander Sport sales in 2013 through the end of April are 7,547 so the IIHS recognition is a big positive for a brand that has been struggling with sales while celebrating 30 years of sales in the U.S. and 25 years of production in Normal, Illinois. The 2013 Mitsubishi Outlander Sport, known as the RVR in Canada (pictured above) has a 148 horsepower 4-cylinder engine that achieves an EPA-rated 31 mpg highway with starting MSRP of $19,170. The only other small SUV receiving the designation is the 2014 Subaru Forester. To earn Top Safety Pick+ vehicles must receive good ratings in at least 4 of 5 tests and no less than acceptable in the fifth test. The new BMW 6 Series M Sport Edition is available on all models and engine variants of the BMW 6 Series range (including xDrive models) adding $4,600 to the base MSRP of the 6 Series Convertible, $4,800 to the 6 Series Coupe, and $5,300 to the 6 Series Gran Coupe. The M Sport Edition models of the BMW 6 Series are based on the traditional M Sport package, comprised of a model-specific M aerodynamics package, 19-inch M light-alloy wheels in double-spoke design, LED foglamps, the BMW Individual High-gloss Shadow Line trim, black-painted brake calipers and exhaust tail pipes in dark chrome. The interior features an M leather steering wheel, M door sill finishers, M driver’s footrest, and sport seats in nappa leather. The BMW 6 Series M Sport Edition adds the new Dynamic Digital Instrument Cluster, Full LED Adaptive Headlights, and the Executive Package. 650i and 650i xDrive models have the Driver Assistance Package. The M Sport Edition will be available starting with July production. The new 2014 Mercedes-Benz S-Class, with two body lengths to choose from, is longer and wider than its predecessor models and comes as an S 400 HYBRID with a 306 horsepower V6, an S 500 with a 455 horsepower V8, an S 350 BlueTEC with a 258 horsepower V6 and an S 300 BlueTEC HYBRID with a 204 horsepower inline-4 cylinder engine. All powerplants take the S-Class to a top speed of more than 150 miles per hour. The new S-Class has features that include a larger radiator grille, an LED-lit interior and exterior without using a single light bulb, brake lights that reduce their intensity at night or while waiting at traffic lights, Road Surface Scan that detects road unevenness with a stereo camera and Magic Body Control that instantaneously sets up the suspension to deal with the new situation. Distronic Plus with Steering Assist and Stop&Go Pilot takes the burden off the driver when it comes to lane guidance and is also able to follow vehicles in traffic jams automatically. There are two high-resolution TFT color displays in 8:3 format with a screen diagonal of 12.3 inches form the new information center in the S-Class. The left-hand display for the instrument cluster and the right-hand display for infotainment and comfort functions. The new Pre-Safe functions can help to prevent collisions with pedestrians and vehicles in front in city traffic, defuse dangerous situations caused by traffic behind and enhance the protection offered by the seat belts. Pre-Safe Plus can recognize an imminent rear-end collision and warn the following traffic by activating the rear hazard warning lights at a high frequency. The Energizing massage function is based on the hot-stone principle and the active seat ventilation has reversing fans and 14 separately actuated air cushions in the backrest, as well as an integrated warming function. There is a choice of six massage programs, two of them using the warming function. The function is also available for the rear seats. The rear seats have four different variants including an Executive seat with a backrest angle adjustable by up to 43.5 degrees, allowing occupants in the rear to concentrate on work or relax in comfort. The new 2014 Mercedes-Benz S-Class is due in showrooms this Fall. The 2013 Volkswagen Beetle Convertible is fun, roomy and intuitive to operate - the same impression I had when I drove the VW Beetle in 1998 when it was reincarnated. A classic key ignition (not a faub sensor tied to a push to start/stop button) and a quick 8 second roof drop time with a simple push of a button. My mission, driving through the ritzy affluent Chastain Park area of Atlanta, was to find the perfect spot to shoot some photos. Little did I know that the 13,000 square foot mansion I decided to use as a backdrop would also come with a full endorsement of the VW Beetle Convertible. I pulled in front of this magnificent home and then began to put the roof cover over the convertible top. A lady walking her dog came out of the driveway of this monstosity and we struck up a conversation that led to her saying, "my Beetle Convertible is more practical than my SUV for going to Home Depot because with the roof down I can load plants and trees in the back seat." Turns out she's had her VW Beetle for two years and loves it. So I stumbled on a credible testimonial in a most unsuspecting neighborhood by pure accident. Her husband then came to check on our conversation and explained "the roof cover goes on much quicker and more easily (over the retracted roof) once you've done it a few times." Good advice from an executive who probably offered his wife a choice of any vehicle on the market and she chose the VW Beetle Convertible. 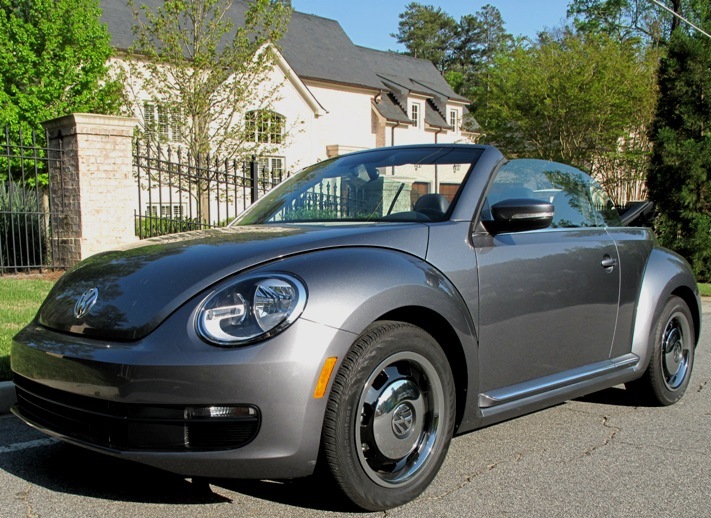 A great sound system and no telematics nightmare in this peppy, solid handling all purpose convertible that I used to commute from a community north of Atlanta to a movie set in downtown Atlanta daily for almost a week. 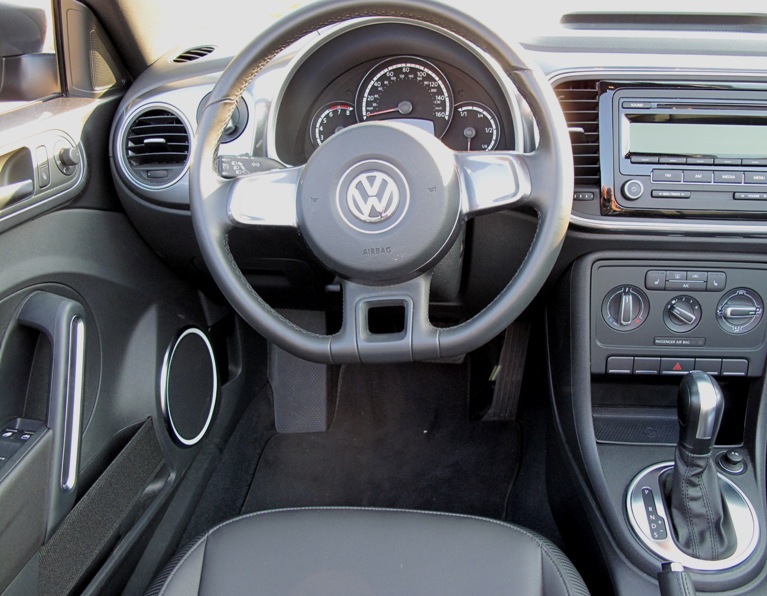 The front seat easily slides forward to let rear passengers enter and exit with ease and sit in comfort. When you're in a certain vehicle, similar vehicles seem to jump out at you, and that was the case with this Beetle which seemed plentiful in Atlanta, including original vintage '70's model Beetles or "VW bugs" with drivers who acknowledged my taste for being behind the wheel in one. This test drive experience brought memories of my girlfriend, now wife, who drove a 1972 Beetle when we were dating - maybe that explains some of my affection for this iconic vehicle, which in it's contemporary rebirth has a lot to offer including practically and affordability. 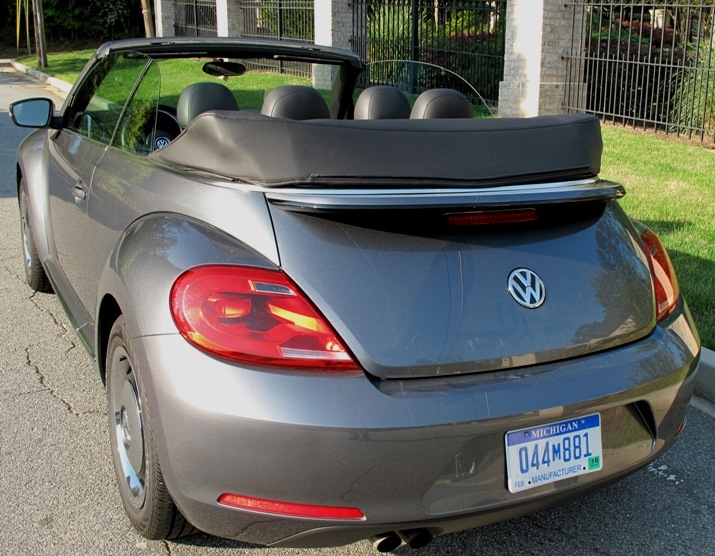 Bottom line: The VW Beetle Convertible is versatile, practical, fuel efficient, affordable with solid handling and an easy-to-operate power retractable soft-top. Former VW Marketing Chief Tim Mahoney (now at GM) told me that more men are buying the Beetle despite a traditionally strong female buying history, now I know why - I felt great behind the wheel. CODA is filing Chapter 11 bankruptcy "to complete a sale, confirm a Plan and emerge from bankruptcy in a stronger position to execute its new business plan. The Company expects the sale process to take 45 days to complete." CODA formed CODA Energy two years ago and says that it is focusing its business strategy on the growing energy storage market. CODA's bankruptcy filing comes just weeks after Fisker's failure. General Motors sold 237,646 vehicles in the United States in April, up 11.4 percent compared with a year ago. Retail sales increased 10 percent, fleet sales were up 16 percent and the fleet mix was 28 percent of total sales. GM's year-to-date total sales of 902,609 is a 9.8 percent gain over 2012. Ford Motor Company April U.S. sales of 212,584 was a 17.9 percent gain over April 2012 and year-to-date Ford has sold 811,067 vehicles, up 12.7 percent for its best April sales since 2007. The Lincoln Brand April sales of 7,615 was a 20.7 percent increase but year-to-date Lincoln sales are 23,514, a 13.4 percent drop from the first four months of 2012. Toyota Motor Sales, U.S.A., reported monthly sales of 176,160 in April 2013, down 1.1 percent on an unadjusted raw volume basis. Chrysler Group reported U.S. sales of 156,698 units, an 11 percent increase compared with sales in April 2012 for its best April sales since 2007. Year-to-date Chrysler sales are 585,050, a 9 percent rise over last year. American Honda reported April 2013 U.S. sales of 130,999 units, an increase of 7.4 percent compared with April 2012. The Honda brand posted April 2013 sales of 117,100 units, an increase of 6.6 percent compared with April 2012. Acura U.S. April sales of 13,899 units increased 14.2 percent compared with April 2012. Year-to-date total Honda sales are 468,650, up 6 percent over 2012. Nissan North America reported April U.S. sales of 87,847, up 23.2 percent. Nissan Division sales were 80,003, up 24.6 percent while Infiniti sales of 7,844 vehicles were up 10 percent over the prior year. Year-to-date sales of 406,128, is a 3.2 percent gain over 2012. Hyundai Motor America announced sales of 63,315, up two percent versus the same period in 2012. Year-to-date sales are 227,645, up 0.8 percent from last year. Kia Motors America reported best-ever April sales of 47,556, selling 6 more vehicles than April 2012. Year-to-date Kia sales are 174,488, down 6 percent from last year. Volkswagen of America reported sales of 33,644 in April, a 10.3 percent decrease over prior year sales. Year-to-date sales of 131,822 is just 0.1 percent lower than a year ago's 131,898 sales through April. Separately Audi reported April 2013 sales of 13,157 vehicles, a 14.2 percent increase over the previous April record set last year. Year-to-date sales of 47,343 is a 15.5 percent gain over 2012. Subaru of America reported 32,943 vehicle sales for April 2013, which represents a 25 percent increase over April 2012 and the best-ever April sales month in company history. Year-to-date sales for Subaru total 125,470, a 17 percent increase over the same period in 2012. The BMW Group in the U.S. (BMW and MINI combined) reported April sales of 29,011, an increase of 8.3 percent from the same month a year ago. Year-to-date, the BMW Group (BMW and MINI combined) is up 5.3 percent on sales of 107,968 in the first four months of 2013 compared to the same period in 2012. Mercedes-Benz USA reported the highest second quarter start in its history with record April sales of 26,157, a 4.4 percent increase over April 2012. Mercedes-Benz models alone saw a 5.8 percent gain in sales volume at 23,635 bringing year-to-date totals for the brand to 92,822. Combined with monthly sales from smart (667) and Sprinter Vans (1,855) MBUSA saw a year-to-date total of 101,371, a 10.2 percent increase over the previous year, making this April the earliest month ever to break 100,000 units. Mazda North American Operations reported April U.S. sales of 19,894 vehicles, representing a decrease of 7.5 percent versus last year. Year-to-date sales through April are down 5.2 percent versus last year, with 98,177 vehicles sold. Porsche Cars North America announced April 2013 sales of 4,032 vehicles, an increase of 17 percent, marking the highest sales month in PCNA history. For the year, PCNA has delivered 13,681 vehicles in the U.S., up 29 percent over last year. 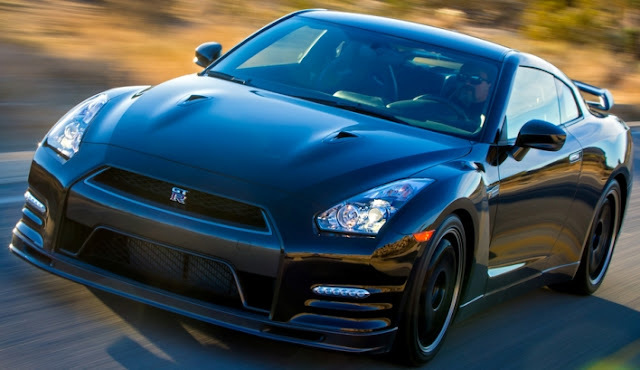 The new 545-horsepower 2014 Nissan GT-R Track Edition has a price of $116,710 (includes $1,000 destination and handling) per car for the 150 that are now on sale in the U.S. The 2014 Nissan GT-R Track Edition features a specially tuned suspension, special brake cooling guides, front spoiler with carbon fiber air ducts, a lightweight quilted cloth mat where the rear seats usually reside, special blue-trimmed high-grip front seats that use a special leather and fabric appointments, handmade, lightweight dry carbon fiber rear spoiler and special metallic black six-spoke RAYS® forged lightweight wheels mounted with Dunlop® SP Sport Maxx GT 600 DSST CTT ultra high performance run-flat nitrogen-filled tires. The new GT-R Track Edition joins the GT-R Premium ($100,590) and GT-R Black Edition ($110,300), which went on sale earlier this year.